Heat oven to 375°F. Remove pie crust from pouch; unroll on cutting board. Place 8-oz ramekin or custard cup on crust; cut 1/4 inch from edge of ramekin to make crust round. Cut 3 more crust rounds from crust. In small bowl, mix chicken and sauce. Fill each 8-oz ramekin halfway up with chicken mixture. 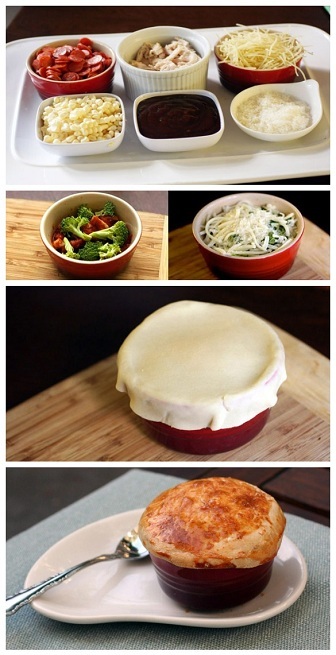 Sprinkle each with broccoli, mozzarella cheese and basil. Wet inside of each crust round; place over filled ramekins. Press down around edge of crust rounds. Sprinkle tops with Parmesan cheese. Place ramekins on cookie sheet. Bake 15 to 20 minutes or until crusts are lightly browned.